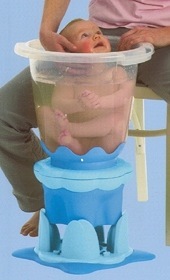 How's this for a baby bath - the Tummy Tub. Apparently it's meant to be womb-shaped and is meant to help with the transition from the womb to the real world. Ermm, I may have ditched biology in favour of geography, but even I can tell it's more bucket-shaped than womb-shaped. Unfortunately, I'm a bit old to remember what it was like, and asking Lizzy is just pointless as she speaks a different language to me. Anyway, the beauty of this little bath really comes to light when you put it on the stand it comes with... it starts to really look like a baby in a liquidiser and conjure up all those jokes we told as kids.